Click on New Survey from the Surveys page. Enter the Survey details in the Details panel. In the details panel, you will be able to select the Survey language, give the Survey a name, a description, and a Thank You message. You will also have the option to upload a logo and choose to hide the Hotjar branding. If you are on a lower plan, you will not be able to hide the branding within your Survey. The Description/Introduction and Thank You Message fields allow you to apply bold, italics, underlining or strikethrough styles, as well as add links to any text in these fields. You select any text you wish to apply styles to, and click on the symbols for the styles you want to apply. Choose how to invite the user to fill out the Survey. Choose the page targeting. Check out the Page Targeting for Feedback Tools Explained and Exclude Pages articles for more information on page targeting. Select the device types on which you wish to trigger the Survey. Whether it is all, mobile only, tablets only, etc. Decide when you want the popup to appear. This is completely optional. 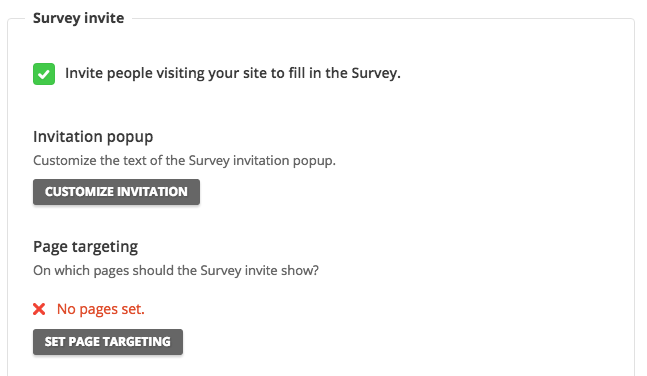 If you do not wish to invite users, leave the Invite people visiting your site to fill in the Survey checkbox unticked. 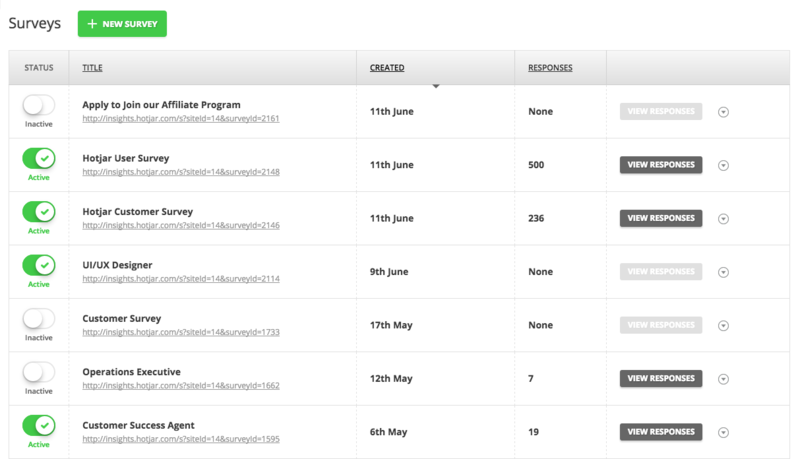 Hotjar allows you to choose exactly how users arrive to your Survey. You could trigger the Survey on your site or send the Survey URL directly through email. Start adding questions to your Survey. In this step, you set up the questions you want to ask your website visitors. Survey layout will differ depending on the type of question you want to ask (including Net Promoter Score, NPS). For each question, you can decide whether the answer is required or not by toggling the REQUIRED switch. Once you save your Survey, it should appear in your Survey list.